It seems that Rockstar Games doesn't tease the gamers with new information about GTA 5 game very often, but as it has turned out, the company has very thought-out marketing plan. Thus, today the first GTA 5 screenshot, dated 2011, appeared in the network. This GTA 5 screenshot was inside the Red Dead Redemption: Game of the Year Edition that was released in October 2011. Some Rockstar forum user told that he had found historically the first GTA 5 screenshot in his copy of the game for Xbox 360. 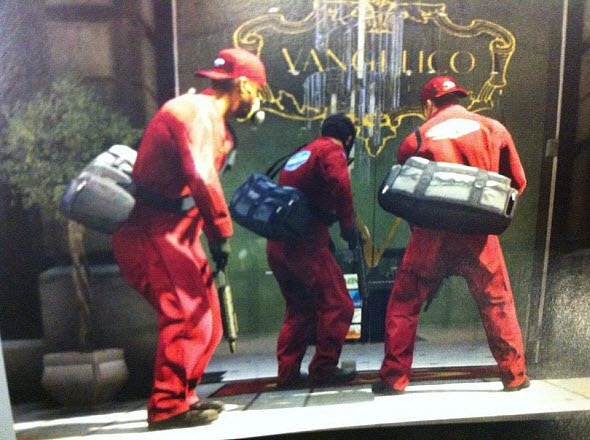 The image is similar to the scene from the first GTA 5 trailer, in which three main game's characters are robbing some building. On this picture we see Michael, Trevor and Franklin in the same place, but from a slightly different angle. If you have some doubts, you can watch GTA 5 trailer once again to see the similar scene in better resolution. And we'd like to remind you that GTA 5 is coming to the shops on the 17th of September, 2013.